We have the safety deposited box for costumers. 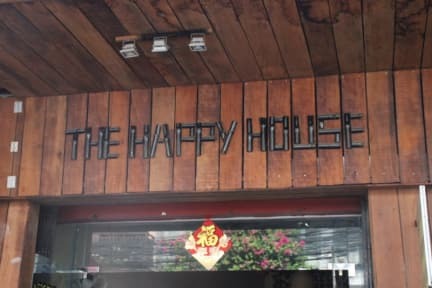 The Happy House is on the street 19 and #151, we are in the center and only 5min from the river side and 10min away from the Royal palace, 10min from Central Market. Thing to Note: We offer a really cheap but bus ticket to anywhere like Siem Reap or Komport.... for only $6 with free pick up from the hostel because most of the time the tuk tuk or taxi driver will take you guys to buy the bus tickets out side that where they scam your money you have to pay a lot more so please kindly note that all we can help you out at the hostel. It provides free WiFi, movie and pool table. The food starts from $1 (Breakfast) and $2 (Lunch). There are also happy hours starting from 6pm to 8pm. The property shows the Killing Fields Movie every evening from 6:00pm. 4. At least 1 day advance notice for free cancellation. Otherwise, the property will charge 100% first night as penalty.